Maybe it's the glittery sugar plums or Clara's fantastical adventure, but seeing a performance of "The Nutcracker" during the holiday season always feels magical. WASHINGTON – Maybe it’s the glittery sugar plums or Clara’s fantastical adventure, but seeing a performance of “The Nutcracker” during the holiday season always feels magical. With several performances to choose from in the D.C. area, it can be hard to pick which one to see. 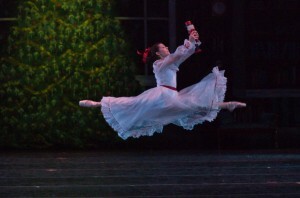 But one annual performance sticks out: the Manassas Ballet’s “Nutcracker” at the Hylton Performing Arts Center in Manassas, Va. The combination of professional dancers and a live, professional orchestra kicks this performance up a notch, since many others in the area use a soundtrack, instead of live music for their “Nutcracker” productions. Tchaikovsky’s score is always beautiful, but there’s something particularly magical about hearing it weave into the air directly from orchestral instruments as dancers tell the well-known story of the young girl whose Christmas gift, a nutcracker, comes to life in an extraordinary way. Local children are featured in the ballet alongside the professional dancers, making it a true community production. It is also easily accessible for Northern Virginia residents, who don’t have to come all the way into D.C. to see the beloved tale. The show runs on Friday, Dec. 20, at 7:30 p.m.; Saturday, Dec. 21, at 3 and 7:30 p.m.; Sunday, Dec 22, at 3 p.m.; and Monday, Dec. 23, at 3 p.m. Ticket prices range from $35 to $55 and more information can be found on the Hylton Performing Arts Center and Manassas Ballet websites. Stay tuned for more Nutcracker coverage from WTOP Living.